Geisha Story is all about the life of a beautiful Geisha Girl. With 15 winning lines available and free spin bonus rounds this video slot is a great edition to our casino. 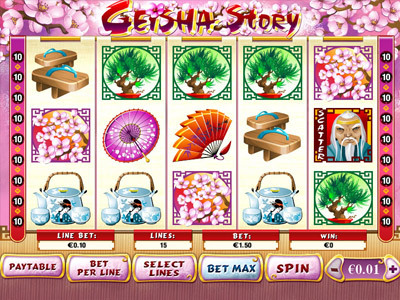 Geisha Story is full of delightful elements that make up the reels symbols. Wooden Japonese shoes, carp (fish), fans, bonsai tress, umbrellas and a kettle for tea plus a japanese style gateway, blossom a japanese boy, a wise man and of course the geisha girl. All graphics are beautifully crafted. The game play is similar to most of our Playtech slots games. 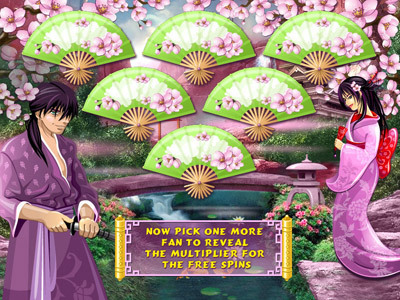 Getting 3 bonus symbols takes you through to the bonus round where you get to choose one of the fans and collect free spins, choose another fan for your multiplier and together you could win enough to have an hour with the geisha girl. Geisha Story is here now. Give it a go!